Sunday night I made an epic dinner. All by myself. Remember how I said I wasn’t a very good cook? Many of my dishes turn out to be a disaster that I have to toss? Well I was a bit apprehensive about attempting to make an entire chicken all by myself. First up: some good tunes to listen to while I cooked. 1. Place rack in upper third of oven and preheat to 400 degrees. 2. 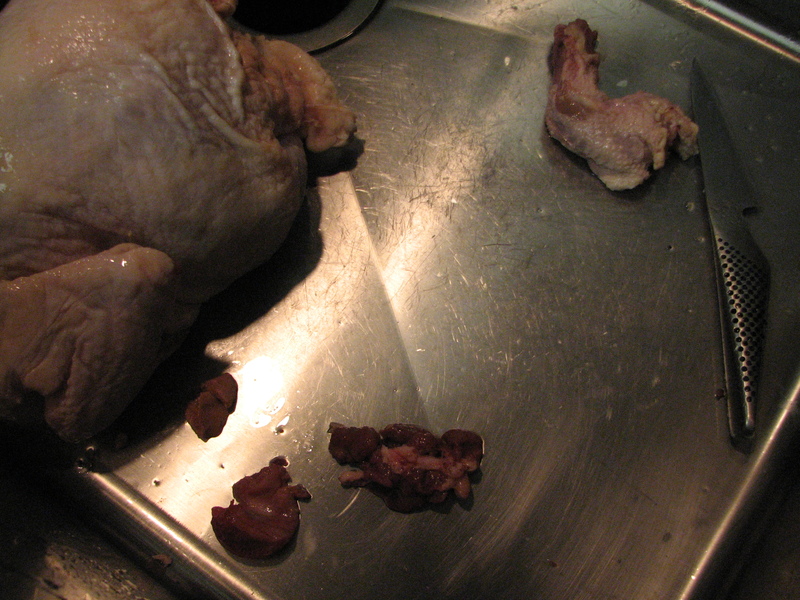 Wash chicken inside and out with cold water, remove the giblets, then let the chicken drain, cavity down, in a colander until it reaches room temp (about 15 minutes). 5. Place the bird breast-side down on a rack in a roasting pan, lower heat to 350 degrees and bake uncovered for 15 minutes. 6. 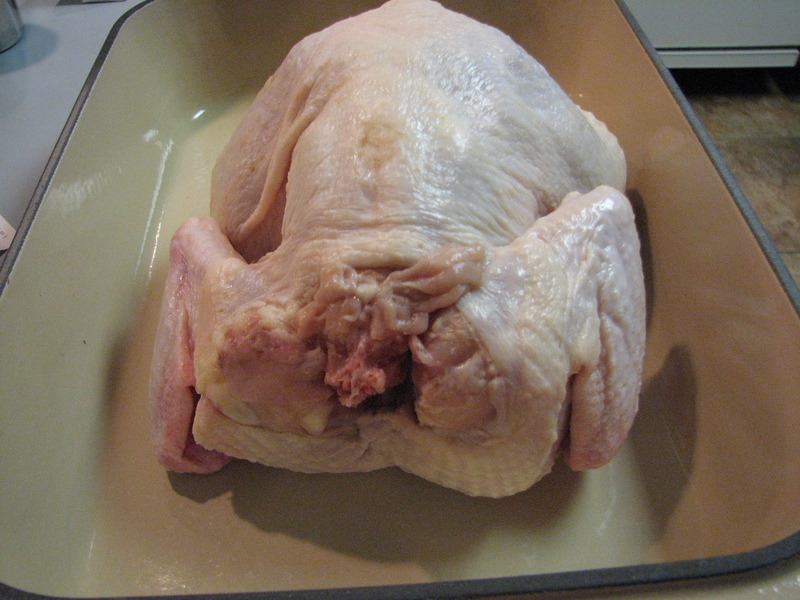 Remove from oven and turn it breast-side up (use wooden spoons! ); return it to oven for 35 minutes more. 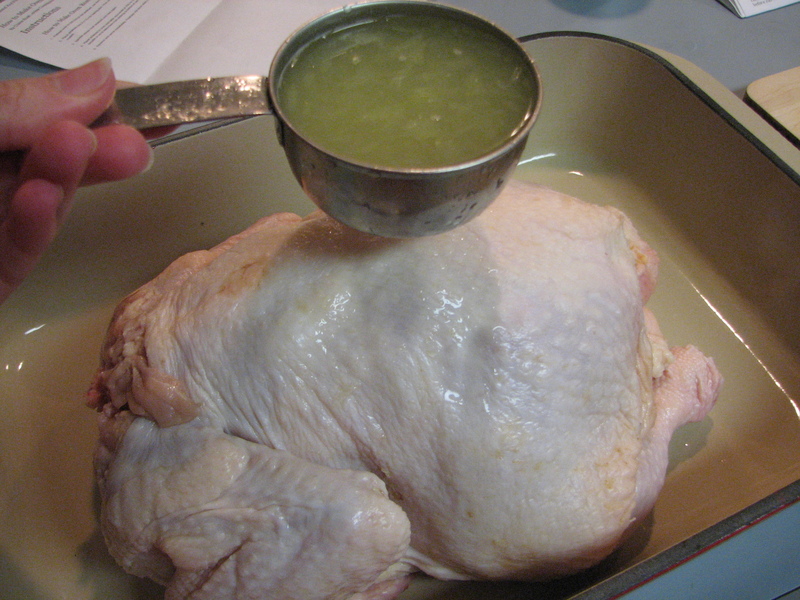 Test for doneness—a meat thermometer inserted in the thigh should read 180 degrees, or juices should run clear when chicken is pricked with a fork. 7. Continue baking if necessary. Let chicken cool for a few minutes before carving. 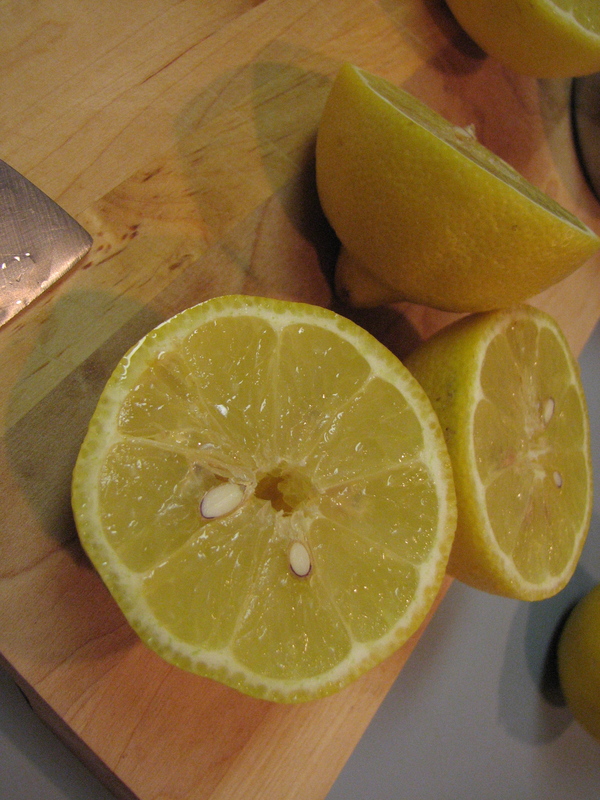 Serve with juices. I made the Chicken with No Name. It has a name but I won’t post it here just yet. 🙂 It’s an inside joke between Michael and I.
I followed the directions and let the chicken sit for a few minutes draining. While that was going on, I got all the ingredients I was going to need. One thing I need to really work on when it comes to cooking is to prep EVERYTHING before I start. And read the instructions all the way through. 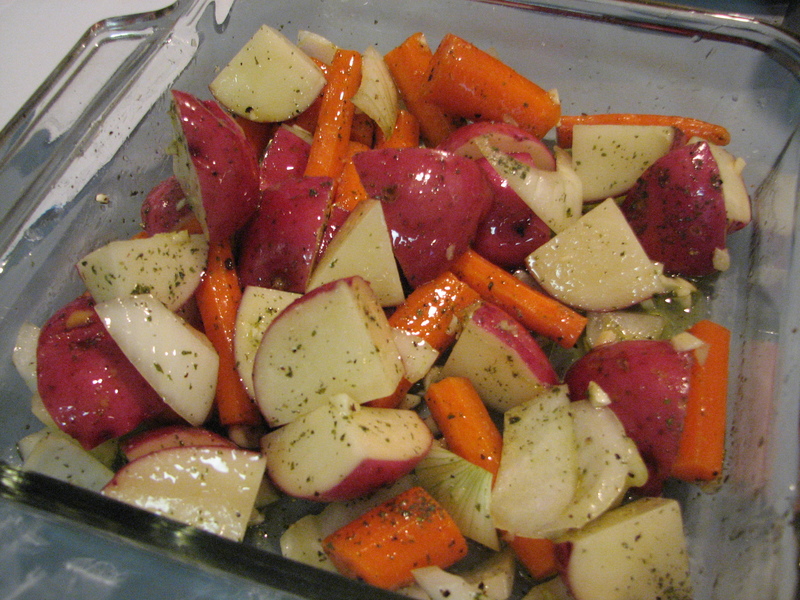 I was also going to roast some carrots and red potatoes and onions. 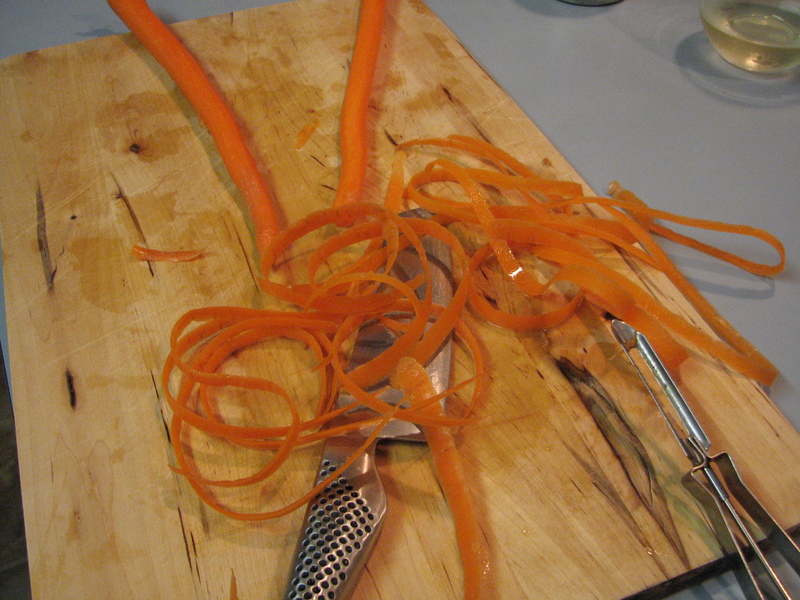 Did I get the carrots ready? Nope. Then I was scrambling. I also didn’t notice that the potatoes took an HOUR in the oven. Oops! More on that later. 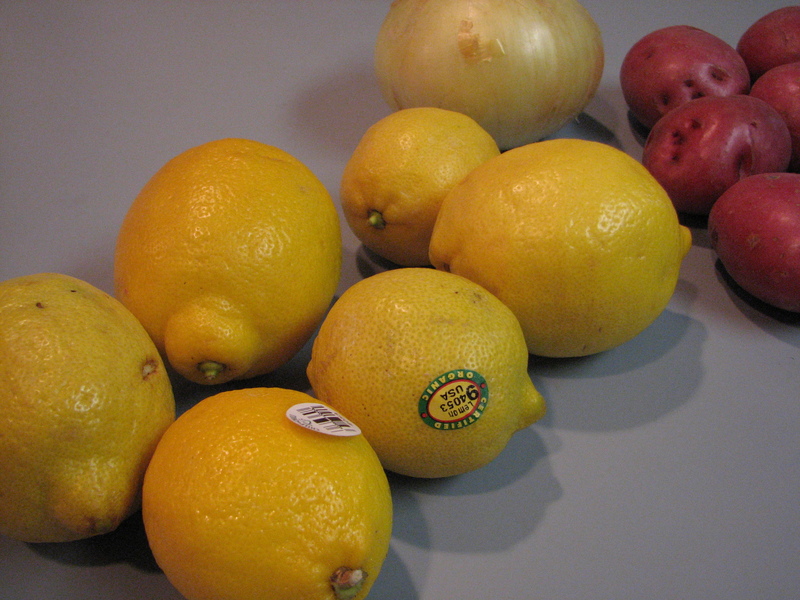 Thank goodness I got extra lemons. I was worried I wouldn’t have enough to squeeze out for 1/2 a cup. 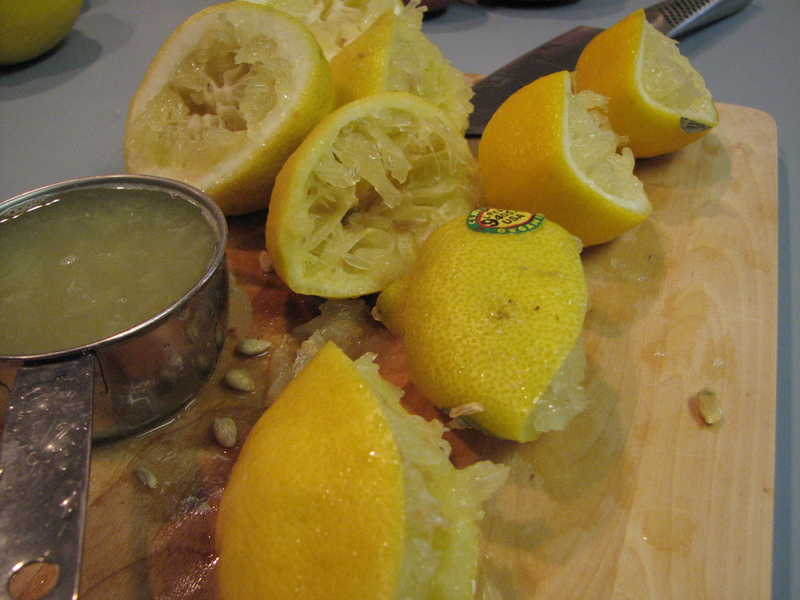 Lots of lemons were used. I dried the chicken off and put it in the roasting pan. 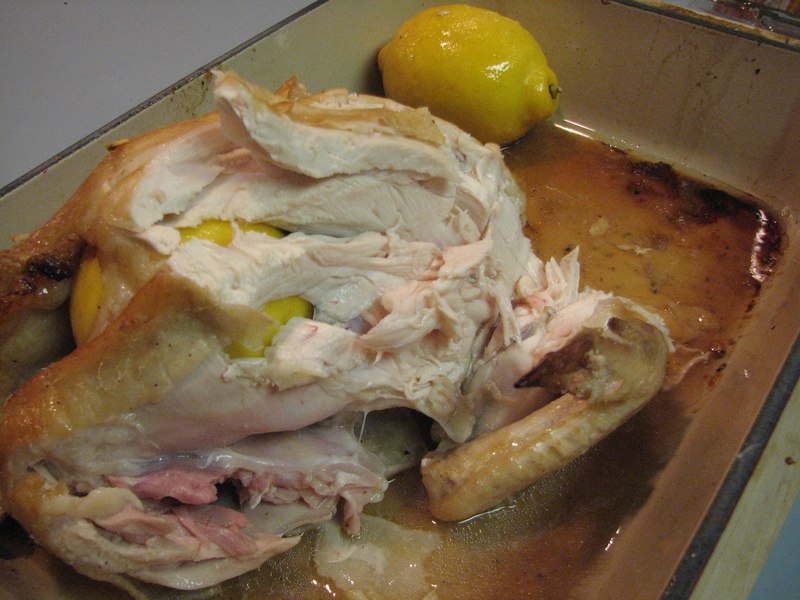 I poured the lemon juice all over the chicken and inside the chicken. 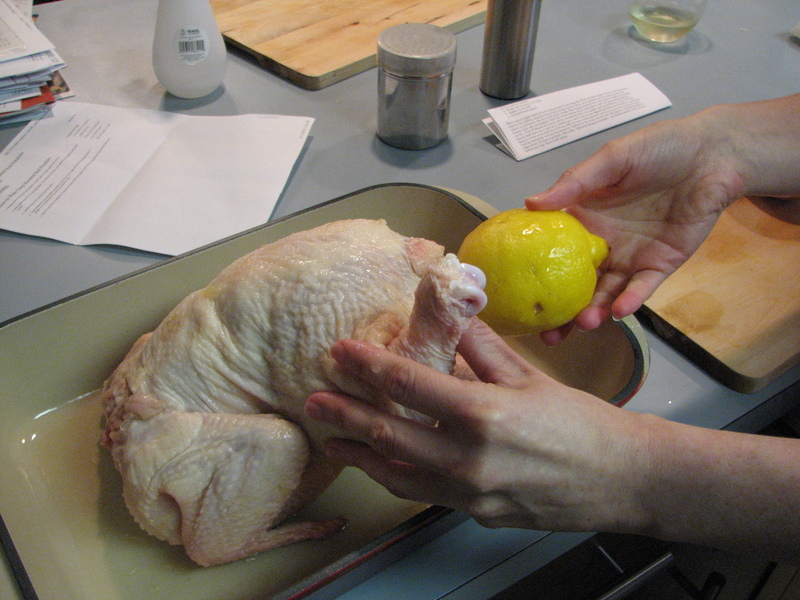 I stabbed the lemon with a fork a few times and then stuffed it inside the chicken. 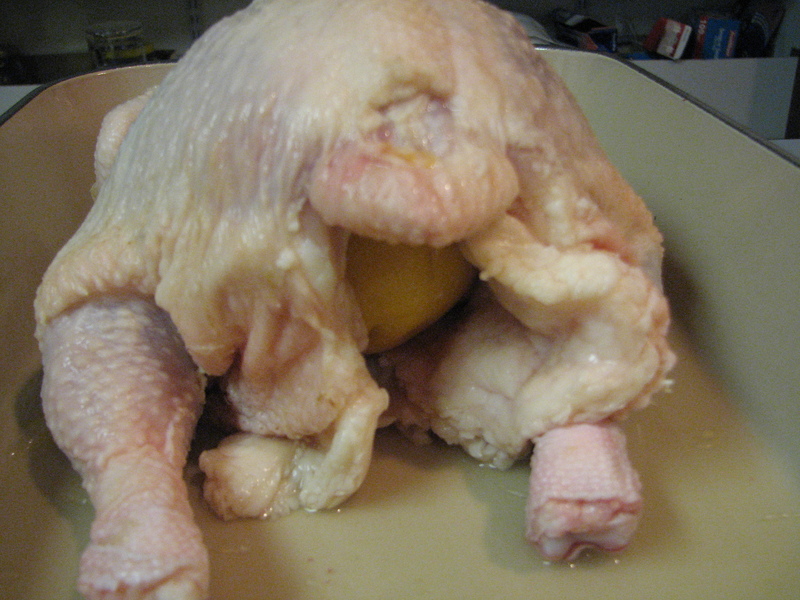 Unfortunately I could not fit both lemons inside the chicken. I popped it into the oven for the first part of the roasting. 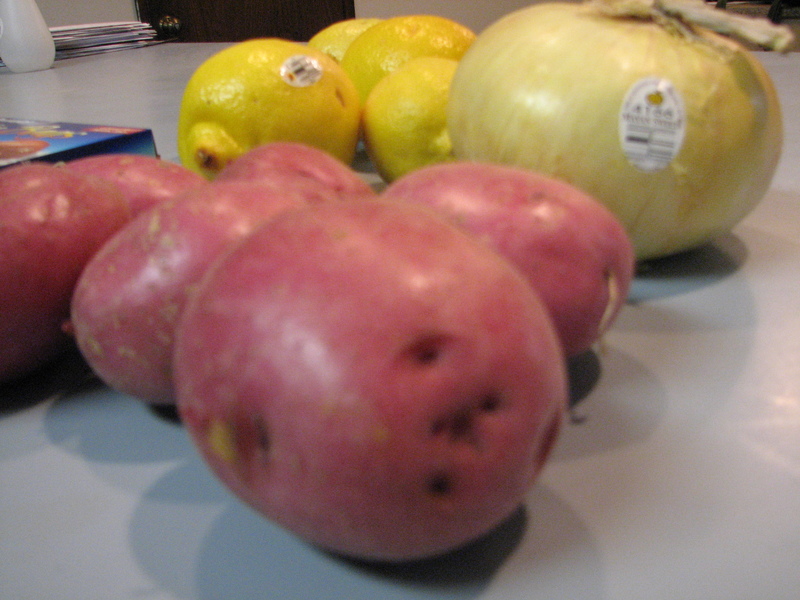 During that 15 minutes I worked on the potatoes. I felt rushed to prep everything because I realized the dish had to bake for an hour! I wanted to make sure everything finished cooking at the same time. I’m usually pretty good at multi-tasking but when it comes to cooking I have a hard time timing everything correctly. I added a little too much olive oil to the mixture. Oh well. Live and learn. 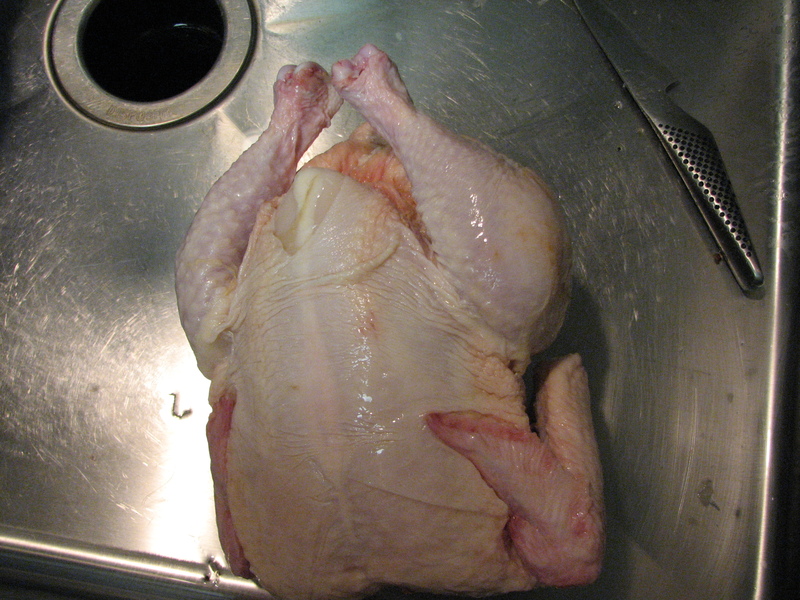 The 15 minutes were up so I took the chicken out and flipped it over. 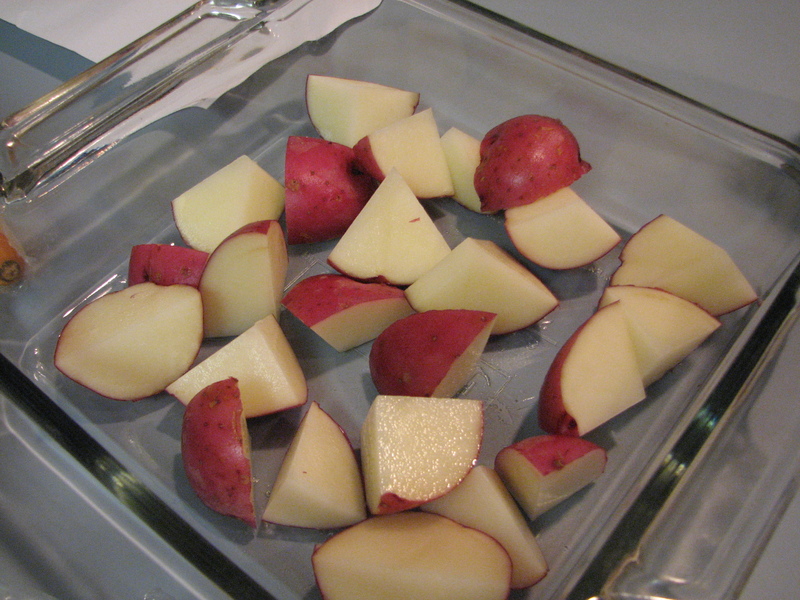 I also put the potatoes in the oven. The recipe called for roasting it another 35 minutes or so. I checked on the chicken and the potatoes every 10-15 minutes. I kept checking the temperature. 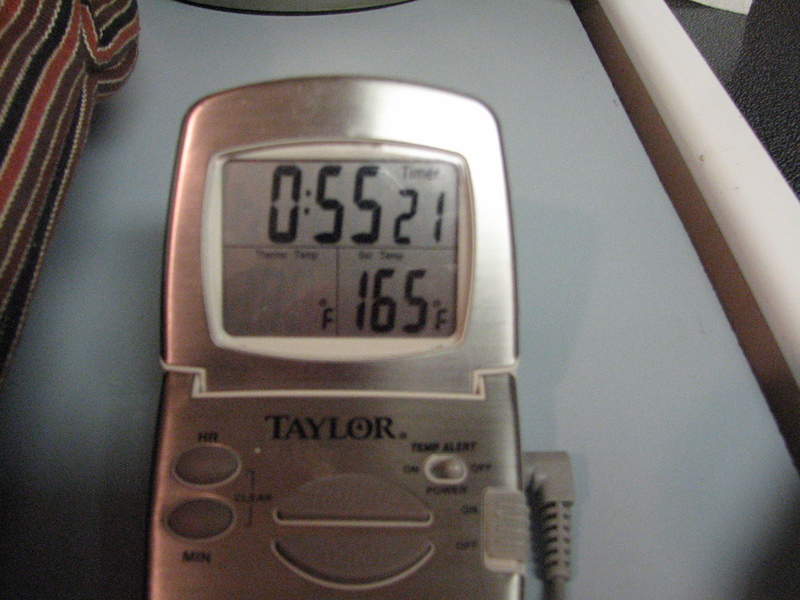 The thermometer said Poultry should be a minimum of 165 degrees. The recipe called for it to be 180 degrees. I realized about half way through the cooking that I stuck the thermometer in too deep because the temperature wasn’t rising. I think I stuck it all the way through to the cavity. I removed it and put it in again and it read the temp right. 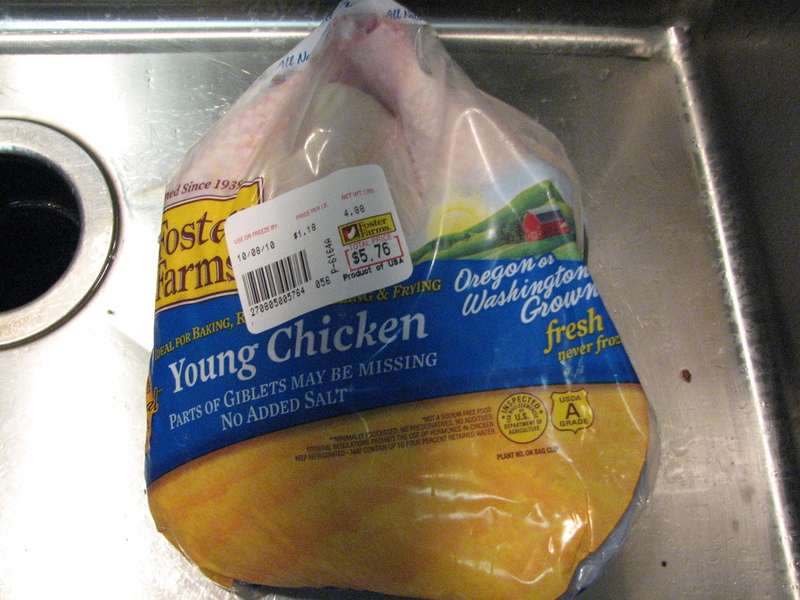 At about 55 minutes I took the chicken out and let it sit a few minutes before carving it. The temperature was over 180 degrees, so that was good. The potatoes were perfectly cooked. I loved the roasted veggies. The chicken was also perfect! It wasn’t dry or overcooked and the meat was so moist and succulent! It was so delicious. And I did it all by myself! I am so proud of myself for doing something so hard (for me). 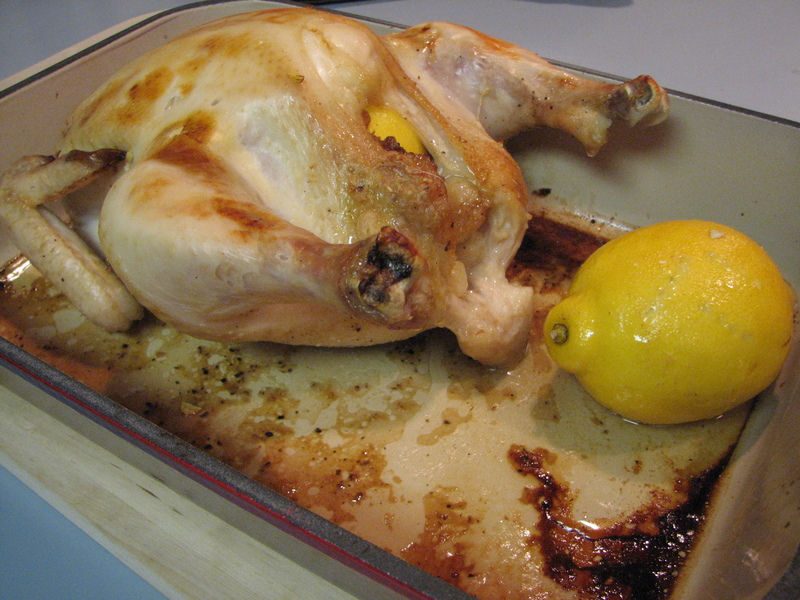 I loved the lemony flavor of the chicken, too. And no I had no ulterior motives for making this dish. 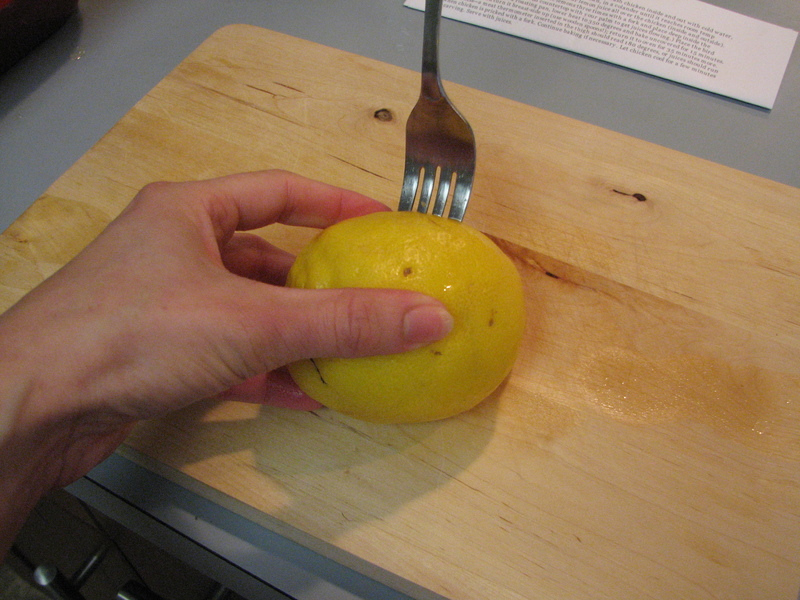 QUESTION: Have you ever attempted something like this? How did it turn out? Look at you go! I think roast chicken is harder than it looks. I’d never heard of the flipping technique (though we have cooked one totally upside down by accident once). My friend makes hers in an oven bag and pours champage on it. It’s soooo good. Yes, the hardest part for me is dealing with the whole bird (and the insides) as a bird. It’s skeevy to me too. Even roasting a half a turkey breast the other morning made me oogy. Beef not so much. Not sure what it is about the birds. I picked up some oven bags with the intention of using it yesterday but decided to give the recipe a whirl before changing it. The champagne chicken sounds good though! What a winning combination! 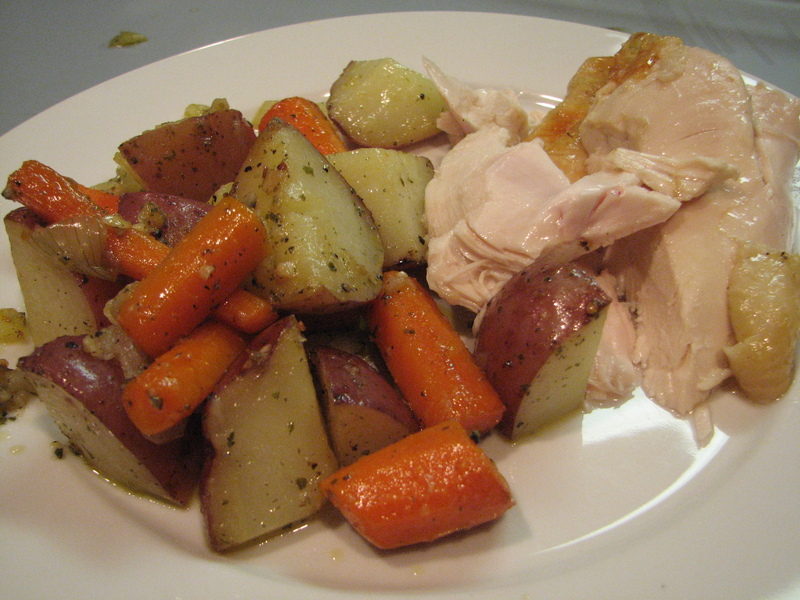 Chicken + lemon + roast veggies = PERFECTION! My mom would stick her arm up to the elbow between the skin and the flesh in order to get pieces of butter all the way around the thing. Grrrosss!! Well, delicious, but Grrrosss!! Great job on the chicken and the veggies looked yummy!! I’m pretty sure butter makes everything taste better! 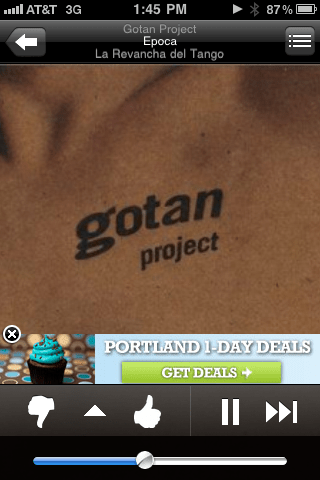 Ooh, could you share a link to your Pandora station? Love Pandora! I have never roasted my own chicken, but my boyfriend and I have done “fake Thanksgiving” twice (to practice getting the turkey cooked properly and all the side dishes done at the right time). After doing a couple turkeys, I was surprised at how easy it is. 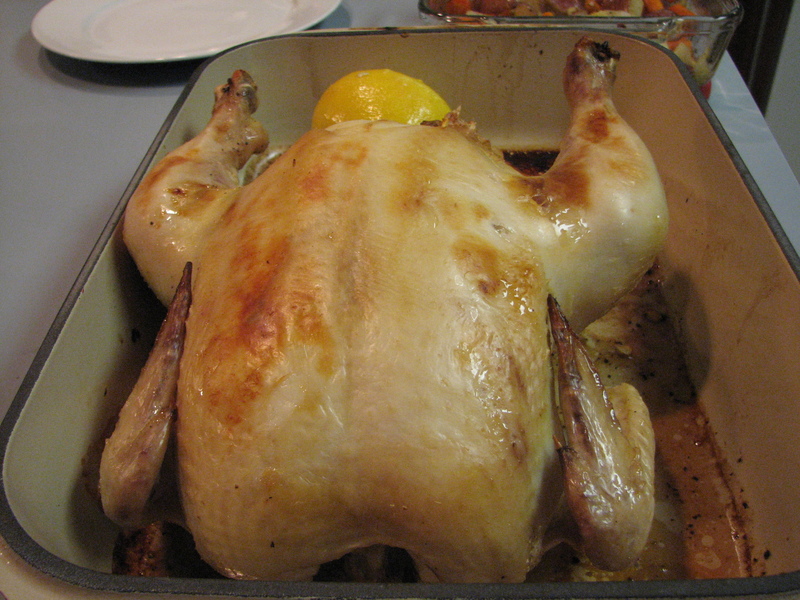 And from the look of your chicken, roasting a chicken is probably pretty easy too! Even though roasting any kind of poultry sounds really intimidating. 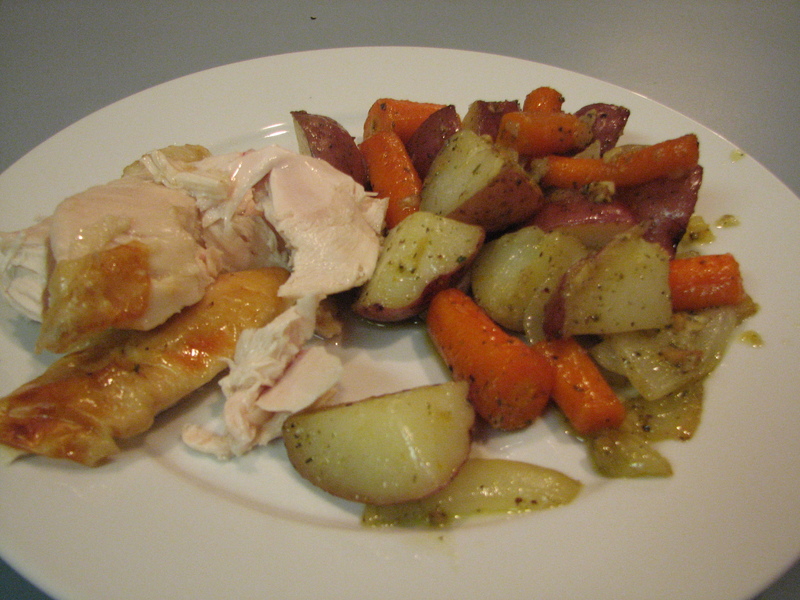 I’m definitely bookmarking the lemony roast chicken recipe, though… sounds great, I would love to try it! It was really good! I would do it again. I like your idea of having practice Thanksgivings! This will be the first year we do it. I’ll see if I can figure out how to link to my Pandora channel. Glad I’m not the only one who listens to Howard enough to remember these details. 😉 It does look good! Hi there! 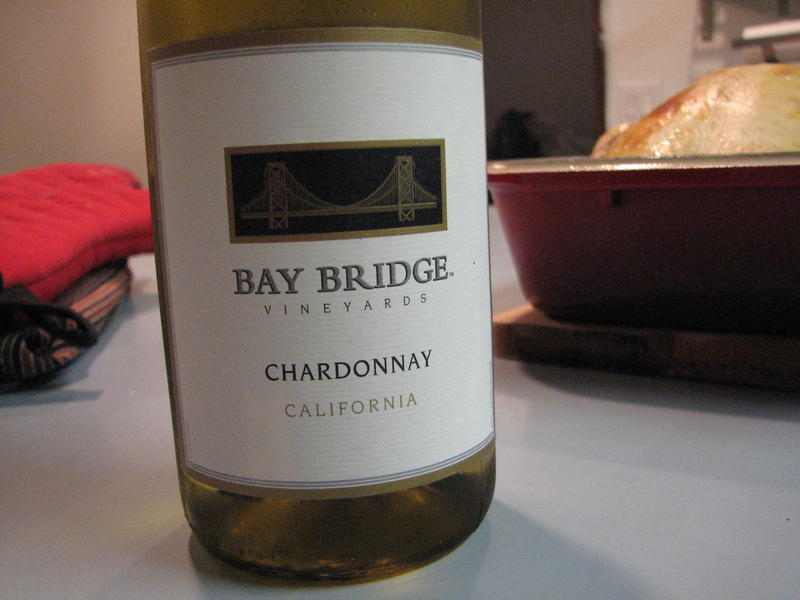 I’m attempting this little creation tonight and was wondering if you could share your Roasted Potatoes recipe? 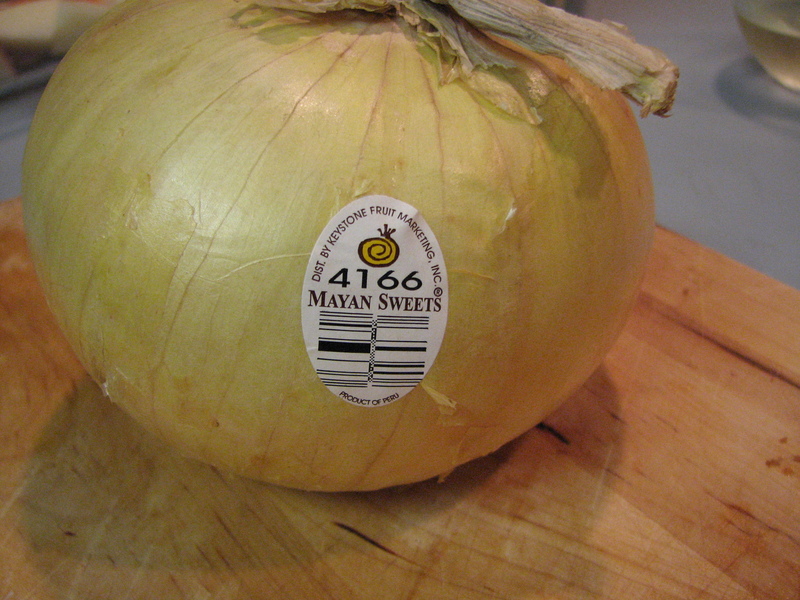 Just so I know the exact instructions…I’m not super savvy in the kitchen. Thank you!